Content DIRECTOR José Miguel Linares EDITORIAL BOARD Alfredo Araújo Amílcar Valencia Diana Tabares Enrique Álvarez Margarita Saade Pablo Urrutia Paulo González Hillary Drummond Carolina Riaño Alberto García EDITORIAL ASSISTANCE Mediática Comunicaciones PHOTOS Gatos Gemelos Comunicación Comunicaciones Drummond Ltd. Colombia DRAFTING, EDITING AND PUBLISHING Gatos Gemelos Comunicación Revista Drummond is a publication edited by Drummond Ltd. Colombia. Together We Build a Better Future It’s time to take stock of the year and express gratitude for the commitment and hard work of all the people who, in their different roles, make Drummond Ltd. a company that brings social and economic development to Colombia. With great sorrow, 2016 brought us the passing of Mr. Garry N. Drummond, a visionary who developed a worldclass project at a time when it was uncommon for an American businessman to bet on Colombia like he did. Mr. Drummond’s warmth and humbleness came through in his relationship with us. Each time he came to Colombia he would tour the operations and talk with the people he came across. He was not only a great leader, but also a great human being, whom we will always remember and whose legacy we will honor daily. This year was also marked by difficult conditions in the coal market. We faced those difficulties as a team, converting them into opportunities to make the operation more efficient, expand our participation in other world markets (such as Asia), and achieve record production and export figures. By the close of the year, we had produced close to 28 million tons and exported more than 32 million tons. In other developments, simultaneously, we were operating during a national conjuncture of peace talks. This brought both challenges as well as opportunities for focusing our efforts and continuing to make a contribution not only to the region – by strengthening our ties with our communities of influence – but also to the country. In the area of human rights, we have bolstered the adoption of the Voluntary Principles on Security and Human Rights and the United Nations Guiding Principles on Business and Human Rights, and we continue to participate in the working group made up of the Presidential Human Rights Council, the Ministry of Mines and Energy, the National Mining Agency, and the country’s main coal producers. A significant achievement in 2016 was what I believe to be the beginning of a change in our stakeholders’ perception, and in particular that of European stakeholders. With the visits we have made in recent years to Europe and European visits we have hosted to Colombia and to our operations, we have been able to effectively transmit our messages regarding our achievements and sustainable practices, highlighting a renewal of the company’s focus on Corporate Social Responsibility and Human Rights. Speaking of the environment, another of the company’s priorities is its commitment to sustainable and competitive extraction, for which we have implemented multiple measures for preservation, mitigation, and control in the operations and their surrounding areas. In addition, we continue to help strengthen the social fabric in Cesar and Magdalena through our College Scholarship Program for the communities in our area of influence. Since 2005 that program has given scholarships to 89 public high school graduates in Sisben income levels 1 and 2 with ten to twelve scholarships awarded each year. Ten to twelve scholarships are awarded each year. Drummond Ltd. can thus reward and create incentives for academic excellence and help train professionals who will be engines for progress in their communities. I invite you to read the three testimonies of scholarship winners in this edition. We also promote development and unity inside our company through five training cycles during the year on matters such as industrial safety, occupational health, development, and healthy interpersonal relationships. We additionally assign an average of 80 college scholarships each year to our employees. The path we have traveled up to this point gives us cause for great optimism, leading us to set big challenges for ourselves for 2017, such as expanding the scope of our operations to include hydrocarbons exploration. We will meet this objective through the gas production project in the Caporo Norte Development Area, for which the path has now been cleared for its execution with the approval of the environmental license. I hope that family union and joy will be part of all our homes, and that opportunities, professional challenges, health, and hopefulness surround every day of our lives this year. in the Chiriguaná and La Jagua de Ibirico municipalities in the Department of Cesar, and has a surface area of 6,462 hectares. Since then, the company’s Hydrocarbons and Mineral Exploration Division has undertaken exploration studies and has shared information about the projects with the communities in its areas of influence. On September 8, 2016, la Autoridad Nacional de Licencias Ambientales (ANLA) approved the Environmental License, allowing Drummond to begin to execute the initiative. Since its arrival in Colombia 30 years ago, Drummond has been dedicated to the exploration and sustainable production of coal in Cesar and Magdalena. Since then, the company’s Hydrocarbons and Mineral Exploration Division has undertaken exploration studies and has shared information about the projects with the communities in its areas of influence. measures to be implemented during the project, as well as contingency measures, to guarantee responsible and safe production and minimizing the impact on the environment. The EIA defined the project’s direct and indirect area of influence and established the baseline (physical, biotic, and socioeconomic). It also identified and evaluated the potential environmental impact of each activity that will take place, and the respective prevention, mitigation, and control measures. 1. Civil Works: Construction activities take place in this phase, such as the adaptation and improvement of access roads, marking out the location of areas to be intervened and clearing, use of cleared material as cover material, and excavation. These measures ratify the project’s overall objective which is “production of coalbed methane gas that is sustainable in terms of the natural and social environment in the Caporo Norte Development Area,” stated Alberto Garcia, Vice President of Drummond’s Hydrocarbons and Mineral Exploration Division. complemented by installing downwell and surface equipment to put each well into production. 3. Production: Actions are taken in this stage to produce gas in the development area, like operating and maintaining the well facilities and the flow lines (water and gas). 4. Closure and restoration: The well locations and their access roads are restored, returning them to the conditions they were in prior to the intervention, and guaranteeing definitive plugging of formations that contain oil, gas, or water, to comply with article 30 of Resolution 181495 of 2009. Drummond voluntarily abides by the International Energy Agency’s Golden Rules that ensure a balance between gas production, the development of the communities of influence, and preservation of the environment. WHAT ARE COALBED METHANE GAS RESERVOIRS? These are (coal) deposits that also, through the natural decomposition of organic matter (coming mainly from plants), were deposited and transformed into the coal seams through pressure and high temperature and that generate gas and water as part of the process. CAPORO NORTE: AN ENVIRONMENTALLY SUSTAINABLE PROJECT Drummond is constantly evolving to effectively respond to the needs of the market. Since 2004, Drummond has expanded the scope of its operations to include the exploration of unconventional hydrocarbons, including coalbed methane gas. 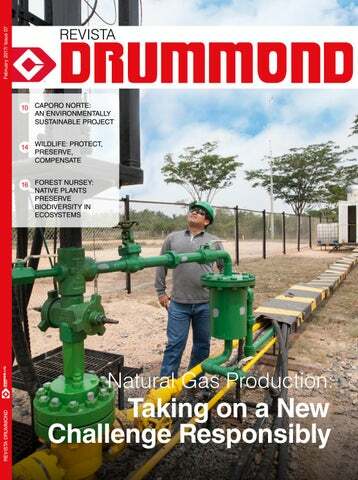 Since then, Drummond has begun exploratory studies and has obtained an environmental license to implement a gas production project in the Caporo Norte Development Area, located in the Chiriguanรก and La Jagua de Ibirico municipalities in the Department of Cesar. On September 7, the National Authority for Environmental Licenses (ANLA in Spanish), approved an environmental license after Drummond completed the respective licensing process as described below. According to the National Authority for Environmental Licenses, an environmental license is a process used for project planning and administration, â&#x20AC;&#x153;that ensures that human and economic activities are in line with ecological and resource-oriented restrictions; it thus constitutes a key mechanism for promoting sustainable development.â&#x20AC;? WHAT IS AN ENVIRONMENTAL LICENSE? The application for the environmental license was officially submitted to the ANLA on December 1, 2014. The process to obtain an environmental license for the Caporo Norte Development Area was regulated by Decree 2820 of 2010 (environmental licensing decree). On January 7, 2016, Drummond filed a request for a reconsideration of the resolution, asking the environmental authority to clarify some technical aspects. The environmental license was issued on December 21, 2015, through Resolution 1655. The ANLA, through Resolution 984, resolved the request for reconsideration filed against Resolution 1655 on September 8, 2016. During the licensing process, the ANLA made a technical visit with three specialized professionals and two auditors to evaluate the physical, biotic, and social components of the project. A delegate from CORPOCESAR participated in the visit as well. Dutch Ambassador with Drummond Ltd. employees during a visit to the Pribbenow mine in La Loma, Cesar. A delegation from Drummond recently visited Germany and the Netherlands to have conversations about a variety of key aspects for business development with different stakeholders. This was within the framework of a series of regular visits with the purpose of strengthening relations with one of Europe’s most important points of entry. Germany and the Netherlands, and others, including potential clients and even civil society organizations,” stated Pablo Urrutia, VicePresident of Communications for Drummond Ltd. The dynamic of these visits consisted in first presenting Drummond’s performance in the area of human rights and corporate social responsibility, describing some of the company’s projects for generating a positive effect within the regions where it has operations. The different stakeholders were also updated about legal proceedings and complaints that have been filed against the organization related to human rights. This is one of the most important aspects to highlight, because in all cases the rulings have been in favor of the company. “We met with different stakeholders, including representatives of the Dutch government, officials from the Colombian embassies in both Germany and the Netherlands, and others, including potential clients and even civil society organizations,” stated Pablo Urrutia, Vice-President of Communications for Drummond Ltd. The visits have allow Drummond’s directors to describe the successful initiatives Drummond has implemented, in cooperation with different organizations, in several regions of Colombia that have had positive effects. “One of the things we shared with them is the work we have been doing with the victims of the conflict, through our environmental compensation program; especially in Serrania del Perija, in the Department of Cesar. We also presented information on the social responsibility programs that work with demobilized persons participating in the Colombian Reintegration Agency’s Program. These actions reinforce our public message of support for the peace process and the resolution of any conflict in a peaceful manner,” added Urrutia. The agenda in Europe is complemented by visits to our Colombian operations by companies that buy our coal, as well as by diplomatic delegations and the representatives of other civil organizations such as Dutch trade union organizations. For 2017, Drummond has defined a clear course in the area of human rights. Based on the suggestions regarding the general impacts of the mining sector on a national level in a report by CREER – the correspondent of the Institute for Human Rights and Business in Colombia –, the company has established a series of objectives that will improve the visibility of its position it on human rights issues to the general public. Together with organizations such as the Human Rights Council at the Office of the President of the Republic, the Ministry of Mines and Energy, the National Mining Agency and two other companies in the sector, Drummond is working to develop social dialogue and best practices as input for the National Plan for Action for Human Rights and Business, promoting the adoption of positive initiatives and using the United Nations Guiding Principles as a reference. Human rights have become a topic of particular interest to the extractive sector not only in Colombia, but around the world. An indicator has now been established to measure corporate performance in this area and evaluate the relationship between a company’s policies and how they are implemented. “We have best practices and a great deal of experience to share with other organizations, so that human rights are not exclusive to one sector of the economy, or for a certain group of companies, but can become an essential aspect of Colombia’s development,” concluded Urrutia. From the beginning of its operations, Drummond has had deep convictions about working in a way that protects peoples’ basic rights, and over the years this commitment has become both more defined and more evident. “We have best practices and a great deal of experience to share with other organizations, so that human rights are not exclusive to one sector of the economy, or for a certain group of companies, but can become an essential aspect of Colombia’s development,” concluded Urrutia. Visit of the German company EnBW to La Aurora, a neighboring community of Drummond’s mining operations. Dutch Embassy delegation during a visit to Drummond’s mining operations. Wildlife: Protect, Preserve, Compensate From the beginning of its operations in Colombia, Drummond has been committed to conserving the wildlife in the area of influence of its projects. Its protection and conservation policies are mandatory for employees and contractors; which help the company develop successful programs for the rescue of wild species (birds, reptiles, and mammals), and their transfer to and adaptation in the areas established by the company for protection and conservation. requently, authorities and communities near major mining projects are questioned in regards to the impact of the operations on ecosystems and biodiversity in areas of intervention. Drummond gives priority to these legitimate concerns, working continuously to mitigate any impacts. The company faces two major challenges in the development of its activities with respect to plants and wildlife: The transfer (relocation) of the animals present in intervention areas. The continuous rescue of specimens that enter the areas of the operation, putting them at risk. The first step is to make an effective commitment to protecting wildlife and plants, assigning areas for the preservation Transferring or relocating wildlife begins by determining the area that and conservation of the native species is going to be intervened and then that live and grow in the region. establishing a conservation area where specimens will be redirected. After Our commitment is described in that, the animals are driven, using the Environmental Policy for Wildlife high-frequency equipment that issues Protection and Conservation, which warning noises, toward the designated promotes preventive and corrective areas. Species that are slow moving are actions through diverse strategies, captured to take them to the relocation which include: the generation of habitats areas determined to have suitable and protection of species during the environmental conditions for these entire productive cycle, the restoration animals to develop. and rehabilitation of the terrain under conditions that guarantee the retention and sustainability of wildlife, the execution The company uses specialized contractors for this relocation work, with of plans to prevent forest fires, strict compliance with environmental legislation, expert biologists. They take charge of and environmental education extended to the entire process, from preparing the ecosystem load capacity studies for the all employees and contractors regarding area to host the displaced species, to the preventive measures that help conserve wildlife drive and/or transfer. biodiversity across the operation. So far this year, 621 animals that form a part of the region’s legacy of biodiversity, have been rescued and cared for around the mines. the sustainability of its projects by protecting and conserving wildlife, while improving environmental conditions for future generations. Native Plants Preserve Biodiversity in Ecosystems Open pit coal mining implies removing the topsoil from the land under production and later restoring it to reestablish the equilibrium of intervened ecosystems. This work requires planting different species of grass and trees. It demands a great number of seedlings that meet high quality standards. For that reason, since the year 2000, Drummond has its own forest species nursery that produces more than 80,000 seedlings each year in benefit of the operation and of neighboring communities. beds, a shaded area for transplanting into bags, and 25 raised beds for the stage of adaptation and growth. They also have an automatic irrigation system to guarantee a supply of water in all seasons of the year. The nursery is run by eight people, including forestry and environmental technicians and environmental engineers, who are dedicated to caring for the seedlings continuously from germination to delivery to the sites where they are assigned for planting. The seeds, the nursery’s raw material, come from two major sources: the plants and seeds collected ahead of time in areas to be intervened by the operations, and purchases from certified providers that can guarantee high quality standards. Seventy percent of the seedlings produced each year are planted in areas directly affected by the mining operation, including dumps and backfill areas, while the remaining 30% are donated to neighboring communities in support of reforestation programs organized by the offices of mayors, community action boards, schools, and other community organizations. In addition to delivering the seedlings, Drummond also provides training for communities on transplanting, caring, and preserving trees to guarantee their survival. Through the nursery, the company has not only met its commitments under the environmental management plan approved by the authorities, but has also been able to plant trees in 450 hectares affected by the mining areas. Drummond plans to increase its production of seedlings to be able to re-forest more zones inside the Pribbenow and El Descanso Mine facilities, and to strengthen the community projects managed in its zone of influence. To guarantee successful replanting that will ensure the best conditions for the development of plants and animals in the region, the nursery handles native species of both timber and fruit trees: Tree Production at Drummond’s Forest Species Nursery Timber Species Acacia, Algarrobo, Rain trees, Cañaguate, Spanish Cedar, Ceiba, Centello, Cannonball Tree, Guacharaco, Guasimo, Guayacan, Iguaamarillo, Maiz Tostao, Higuerilla, Mataraton, Melina, Moringa, Neen, Olive, Pine, Polvillo, Savanna Oak, Swingla, Calabash tree, and White Manjack. Fruit Species Sugar-apple, Soursop, Guava, Lime, Mamon, Mango, Cashew, Orange, Mandarin Orange, and Tamarind trees. During the year 2016 alone, Drummond produced 50,540 seedlings. Of the total, the company allocated 38,395 to reforestation projects, planted 28,195 in areas in the process of recovery, and donated 10,200 to projects in neighboring communities. This entire effort helps guarantee that ecosystems and habitats will be balanced and suitable for the development and preservation of the region’s native plants and wildlife. in Cesar and Magdalena Drummond firmly believes that education is fundamental for transforming and promoting progress in communities. That is why the company has had a College Scholarship Program since 2005, through which it rewards the academic excellence of high school students in Cesar and Magdalena. o date, this initiative has helped provide a college education to 89 students from families in Sisben income levels 1 and 2 (low-income families) who have graduated from public schools. The scholarship covers 100% of tuition and provides a subsidy each semester for room and board. In an interview with Revista Drummond three of the beneficiaries tell how the scholarship changed their lives. One of them is currently in college, another is doing an internship, and the third is working at Drummond showing the program’s impact from different perspectives. Jose Bautista, Civil Engineering student (scholarship awarded in 2016) Revista Drummond: How did the Scholarship Program change your life? Jose Bautista: I come from a low-income family, so for me it’s a huge challenge to obtain the resources to go to college. I’m grateful to Drummond for giving me this opportunity, and I’m making the absolute most of it. R.D. : Why did you decide to study Civil Engineering? J.B.: In high school I did well in math, physics, and technical drawing, subjects that are closely related to my major. Once I heard about civil engineering, I decided that was my field, and now I’m doing it. R.D. : What message would you like to give high school students? J.B.: Hard work and dedication to your studies are basic for fulfilling your dreams. Take advantage of what they teach you at school. Cindy Mejia, environmental and sanitary engineering student, currently a Drummond Intern (scholarship awarded in 2011) Revista Drummond: What impact has the scholarship had on your life? Cindy Mejia: I really wanted to get a college degree, but sometimes good intentions aren’t enough, because you also need the finances, which I didn’t have. Fortunately, Drummond gave me a scholarship and I could fulfill my dream of studying environmental and sanitary engineering. The company has been the biggest blessing in my life and in that of my family. R.D. : How is your internship going? C.M. : At Drummond I’ve had the chance to reinforce and apply what I learned at school. I got this internship by being a good student, because the company is quite strict about that. I sent in my application, and thankfully they called me. R.D. : What is your professional dream? C.M. : I want to study English and earn a Master’s degree in environmental management. And I also dream about working for Drummond. La Loma Agreement: •	Established in 2005 •	Awards a yearly scholarship to the two best high school students in Cesar and the two best high school students in Magdalena •	The beneficiaries can choose their field of study. In an interview with Revista Drummond three of the beneficiaries tell how the scholarship changed their lives. Revista Drummond: How did this scholarship transform your life? Juan Martinez: The Scholarship Program had a huge impact on my life and on that of my family, because, since the scholarship pays for tuition and room and board, I was able to dedicate myself exclusively to my studies, without having to think about how I was going to pay for the next semester. It was a huge financial relief. R.D. : What message would you like to send Drummond? J.M. : I’m enormously grateful to the company for the opportunities it has given me. First, the scholarship, and then an internship at the Port facilities, and now I’ve been formally hired as a Warehouse Assistant at the El Descanso Mine. Thank you very much for changing my life. R.D. : What are your professional expectations for the future? J.M. : I’m just focused on my work. Day by day I work hard to do the best I possibly can. 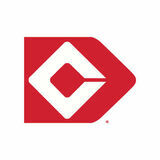 I want to continue to be a part of this company and move up the ranks professionally. with our Communities At Drummond, we are convinced that the development path is forged from alliances with all stakeholders, including communities. For this reason, we maintain our commitment to contribute to the regions with our social responsibility programs, to have increasingly competitive and sustainable regions. HEALTH BRIGADE IN SIMON BOLIVAR NEIGHBORHOOD, IN CIENAGA In August, 302 people benefited from a health campaign at the Dario Torregroza Perez School in Cienaga, Magdalena. Children and adults had access to services that included general physical examinations, pediatric consultations, and dentistry, as well as providing medicines and dental kits in accordance with prescriptions issued. This initiative was possible through the leadership of the Amigos del Carbón Foundation, in association with Drummond and other public and private entities. 100,000 PEOPLE TO BENEFIT FROM A NEW ALLIANCE BETWEEN DRUMMOND AND THE SOCIAL PROSPERITY INSTITUTION The goal of the alliance is to improve living conditions in the towns in the areas influenced by the company’s mining and port facilities, by making improvements to 200 homes, and strengthening productive projects and early childhood programs in nutrition and food security, among other activities. COMMITMENT TO THE PRESERVATION OF SPECIES OF THE CARIBBEAN REGION The company has put in motion its “Plan for Restocking Native Fish Species in the La Pachita and Mata de Palma Wetlands,” which will stock more than two million juvenile Bocachico and Dorada fish in the towns of Potrerillo, La Loma and Puente Canoa, Cesar. The first restocking took place in the La Pachita and Mata de Palma wetlands. Prodeco also participated in the program, along with fishing communities and the respective environmental authorities. CORPOCESAR RECOGNIZES DRUMMOND’S SUSTAINABLE MANAGEMENT On August 26, during the celebration of the “Sustainable Management Awards Night,” Drummond received an award for its contributions to the Environmental Compensation program in Serrania del Perija. The program benefits more than 100 rural families, ensures the recovery of ecosystems, and promotes the development of productive projects in the area through sustainable farming practices that are environmentally friendly. SCENARIOS FOR PEACE: 743 CHILDREN IN CIENAGA BENEFIT FROM A NEW MULTIPURPOSE PLAYING FIELD The La Maria School located in Cienaga, Magdalena has a new sports field. During the inauguration, students received brochures about developing values, which were put together by former combatants using recycled materials. The playing field was built by Drummond, Fundepalma and the Office of the Mayor of Cienaga. ‘LEADERS IN PREVENTION’ PRIZE AWARDED FOR IMPROVEMENTS IN THE RISK CONTROL AND SAFE WORK SYSTEM On October 6th, Drummond was awarded from Colmena, the Leaders in Prevention 2016 prize, in the ingenuity category, for its project called ‘Safe work system for changing the dumper cable on the four car dumper,’ which was developed by Alvaro Perez, a conveyor belt mechanic. The project received an award for its improvements in the quality of life of workers, business productivity, and social impact on the communities through good practices in occupational health and safety. What started as Saturday Family Day, has become a full day for employees, their loved ones, and the company to get to know each other better. Each year, close to 900 workers enjoy Family Day with Drummond. Family Day with Drummond is a venue for the family members of employees to get to know the operation, while employees spend time with their coworkers, supervisors, and managers in an environment focused on safety, music, and good cheer. The day starts at 8:00 in the morning and goes until 3:00 in the afternoon. It includes a welcome activity, presentations on safe working environments, a snack, guided tours of the operation, photos with the huge and heavy transportation and extraction machinery, fun recreational activities for the littlest ones, and a lunch with musical entertainment. This allows workers and their families to get an idea of the magnitude of their contribution to the business, reaffirming their pride in belonging to the organization. Evolution Over Time of the Program •	Previously the program was called Saturday Family Day, a weekly event to spend time together at the Port and the Mine. •	In 2014, this program was transformed into what we now know as Family Day with Drummond, which takes place at the mine three times a year (once for each work shift). •	In 2015, the event was postponed because of the crisis in the mining sector and the cost reduction program. •	In 2016, the event was resumed for shift three at the Mine, to take place on December 28. •	The workers at the Port will be able to enjoy this initiative in 2017. In the year 2008, I started a three-month internship in the Lubrication Department. I wasn’t lucky enough to end up working directly for the company after the internship, but even so, I was very grateful to Drummond. After some time, I began to work at another company and I was there for more than three years, but my dream of working for Drummond remained alive. Time went by and thanks to Fredy Gongora, who helped me in the in-house program, I had a chance to come back and join Drummond Ltd. once again. y name is Alcides Peinado, and I’m from the La Loma district in El Paso, Cesar. I’ll always remember that first moment when my dream of working at Drummond first looked like it might become a reality. That was in the year 2006, when I was about to finish high school at the Benito Ramos Trespalacios School in La Loma, Cesar, and we received the wonderful news that Drummond was going to sponsor the students who received the top five scores for the ICFES standardized test. I was one of the top five. Now, I have been working at Drummond for four years in the Coal Department at the El Descanso Mine as a Truck Operator, a position where I plan to give my best in gratitude for everything Drummond has done for me. Together with working for Drummond, my greatest passion is painting, which gives me peace. I feel like it’s a beautiful gift God has given me from the time I was very young, and as time has gone by I’ve been improving, learning new techniques like oil painting on canvas and portraiture. This has allowed me to become one of the best artists in my town, La Loma, Cesar. Before that, as I approached graduation, I had been worried because I wanted to go on with my education, but my parents didn’t have the resources. But as they say here, “God is there to help,” and soon after that I received the call I had been longing for from Drummond. I went to Valledupar to study heavy equipment maintenance at SENA for a year and a half, something that was a great joy to me. The days and months went by quickly and I soon finished. That meant I was able to become a heavy equipment maintenance technician thanks to Drummond. Then I had to start another phase.